alaTest has collected and analyzed 56 reviews of Samsung HMX-E10BP. The average rating for this product is 3.4/5, compared to an average rating of 4.0/5 for other Camcorders for all reviews. Reviewers really like the portability. The usability is also appreciated. We analyzed user and expert ratings, product age and more factors. 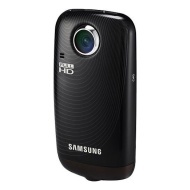 Compared to other Camcorders the Samsung HMX-E10BP is awarded an overall alaScore™ of 80/100 = Very good quality. Very impressed with my purchase, easy to use, quality of video and stills excellent. Bought it to video my Granddaughter growing up, so lots of family use. It light and fits easy in pocket, no bigger than a Blackberry or iphone.